12 registered (Zep, Shorty, BrianL, Clay N' Pray, Bing, ShaneM, Bob-O, Bocomo, teehjaeh57, RStringer, rjackson, FireIsHot), 209 Guests and 184 Spiders online. My pond in southwest MI is about one acre and about 9 feet deep with a shallow finger. It is about full now and I would like to start thinking about fish. My goal is to be able to periodically catch a small mess of blugill and eat them in cabin on property. I don't care if they are super large. How do I go about this and is it even a reasonable goal for a small pond. There is various cover in different depths but no plants of any kind yet and no fish. I will try to figure out how to post pics but I am very dumb. So basically, you're asking is it reasonable to expect to grow a decent number of fillet sized BG in 1 acre pond with a maximum depth of 9 feet in SW MI? If so, I think it is very reasonable. My biggest concern would be the shallow nature of your pond... I would highly recommend an aeration system, particularly in the winter to prevent winter fish kill. Are you just interested in BG as a food fish, or would you consider any other species, such as YP? Feeding would make this process go faster improving the growth rates of your BG substantially and increase the overall carrying capacity of the pond but that it's not necessary. Yes that is correct. So the minnows feed the bass and the bass keep the BG from turning into a million small stunted BG. I have power there so a bubbler could easily happen. Thanks for the stocking rates and all your input. Yes, in northern ponds the stunting of BG is a major concern. Stocking your BG ahead of your bass in ponds as far north as yours will almost certainly lead to stunting of the BG and can be very hard to change. In northern ponds it's best to give the LMB a good head start over the BG. I like to have the LMB spawning for the first time the same spring the BG do. If you are interested in YP, these can be stocked as well. With LMB present, you may have to restock them every couple of years. If you pellet feed your fish, and stock pellet trained YP you could grow some very nice sized YP to supplement your BG fillets. Two fine eating fish... After about 3 to 4 years, you can harvest a dozen or so LMB per year to eat as well if interested without harming their control over the BG. Should I locate real BG when the time comes? Looking at the fish hatcheries around here it looks like only the hybrid are available? Also what to fathead minnows eat? I want to make sure there is somebody eating possible mosqito larvae? FHM do a number on the mosquito larve. If you are going to be yanking fish out and feeding, HBG grow faster than standard BG for the first couple of years. If nobody in Mi. has the fish you want, I think there is at least one fish dealer in OH that delivers to Mi. and they should have what you want. Thanks. Will the hybrids reproduce enough so I can catch gills and eat a mess now and then? I will keep looking for the regular bluegills here and in Ohio. You'll most likely have to periodically restock the hybrids. The young don't have the growth rates of the parents. I may use some HBG but would prefer regular BG. Anyone know of any sources for BG in the Southwest Michigan area? Thanks for the HBG info which I will study. Pure strain BG are very hard to find in MI since the MSU Extension Sport Fishing Mgmt Bulletin states: ""BEWARE" of this combination (BG-LMB). It is a favorite in the south where it can work, but it is oversold in the North. Bass are supposed to control BG by predation, but it does not work that way in our climate. The BG overpopulate the pond and then both LMB and BG have stunted growth. IF you want LMB&BG anyway give the LMB 1-2 yrs head start in growth and spawning. Then they may have more affect on the BG"". End quote. The MSU Bulletin may be available 'online'. Here is a fact sheet about MI stuntd BG. 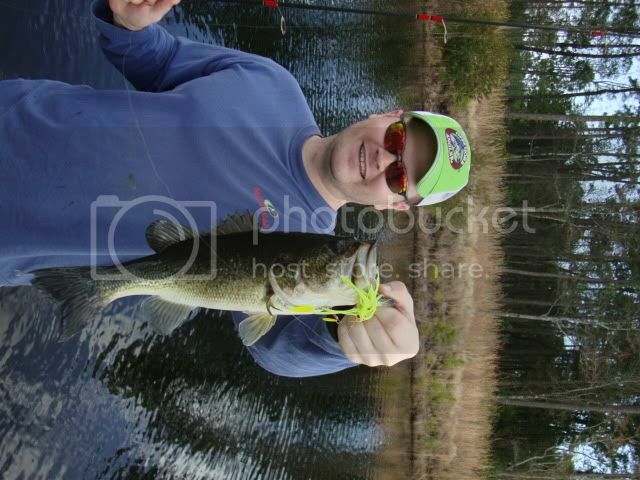 I could not find the Managing Michigan Ponds for Sport Fishing for free online it costs $4.00. MSU bulletin is more encouraging for using HBG in ponds, thus lots of the MI fish farms only sell HBG. Pure strain BG are available at a few northern Ohio fish farms and a few farms in MI, depending on where you live, you may have to do some driving of 2-4 hrs one way to get your fish. Usually at fish farms, all you have to do is show up with money and they can supply fish and hauling containers to get your fish back home. Plan a road trip for fish. Make it a family adventure, the kids will remember it for years. IMLAY CITY Fish Farm Imlay City (810-724-2185) has a couple sizes of BG, RES, HBG, Rock bass, yellow perch, LMB, SMB. MDNR probably has on their website fish hatcheries and what they sell. IMO the LMB-BG combination can work very well in northern states, IF, as with ALL fisheries, the pond is managed properly. Mismanagement almost always is the cause of poor quality fisheries. Good pond management is what we are all about here at Pond Boss - teaching you how to BEST manage your pond and fishery - be it in the north, east, west or south. Wow, thanks Bill for your work on this. I will do more research but maybe think towards the hybrids. Hybrids and pure strain BG can easily work well even in MI waters. Big BG do grow in MI esp in the southern lower part. Both fish do well and grow big relatively fast with pellet feeding. All it takes is proper management to maintain a quality fishery that has the proper balance of fish based on your goals. The abundance of underwater weeds contributes a lot to BG overpopulating due to the bass not being able to 'catch' smaller BG - too many hiding places for small BG. An overabundance of smallish bass usually adequately thin BG and results in numerous larger BG. Then feeding the remaining BG allows them to grow fast, large and in higher numbers. Remember to harvest some BG especially the adult females annually, if you feed the fish. Thanks again folks for the help. I have read several academic papers and some extension type stuff and I am very frightened of the possibility of stunting. All it would take would be some weekend bass keeping tresspass that you don't know about and its over. I think more and more I will first try the HBG for a year or two and go from there. So now the fatheads, 100 LMB in the fall and the HBG next spring. Keep in mind that if HBG are the primary forage fish, then the LMB have a hard time growing larger than 12"-13" long which is okay for some people. I'm in SW MI as well (Paw Paw) and have a pond stocking in my near future. With the above combination of HBG and LMB, what additional forage base would you recommend that would help to grow the LMB beyond the 12"-13" range? IF you want what I would do, I would use pellet fed LMB. Then you have good control of their growth. Their offspring will not be pellet trained, but those fish you can remove for eating. One should be able to recognize pellet eaters vs non eaters due to size and/or plumpness. If you need a second forage fish I would try pumpkinseed sunfish and or golden shiner, with some crayfish. Diversify the forage base to enhance the overall forage so one species does not bear all the pressure. Also when using natural forage keep the numbers of LMB low so the bass population does not need as much total food for growth. More bass need more food! If you are adventurous you could try HBG and SMB and maybe GSH. I think that combination could work okay with attention to good management. I don't know the percentage of young LMB, but a buddy has pellet trained lMB in his pond and some YOY LMB are taking after Mom & Dad - eating pellets. I like the GSH and PS ideas.